Dwayne Johnson has always been a buffed guy, having been a professional wrestler before becoming arguably the biggest star in Hollywood right now. But if you’ve been following his career through the years, you would notice that he has become bigger in the past few years. This is due to the Dwayne Johnson workout that he has been religiously following. How did Johnson bulk up for his roles like Hercules? Here is the training program that “The Rock” followed in preparation for his role as the son of Zeus. The first exercise to build up a bigger chest is the dumbbell bench press. You can start with four sets of 10-12 repetitions, before doing three sets of flat bench cable flyes. Perform as many repetitions of flat bench cable flyes until you could no longer do so. After finishing flat bench cable flyes, you will have to complete four sets of barbell bench press. Complete four sets of 10 to 12 repetitions. Once you’re done proceed to do four sets of low cable crossover, aiming to make 10 to 12 repetitions. End the day with three sets of barbell incline bench press with 10 to 12 repetitions. Legs would be the focus on the second day of training. Start with four sets of leg press, aiming to complete 25 reps for each set. After that, do four sets of barbell walking lunge with 25 repetitions for each set. After a brief rest, continue your workout with three sets of leg extension. Each set should have 20 repetitions. Then proceed to do three sets of 20 reps of seated leg curl, and three sets to failure of Smith Machine calf raise. End your workout with three sets of 15 repetitions of thigh abductor. 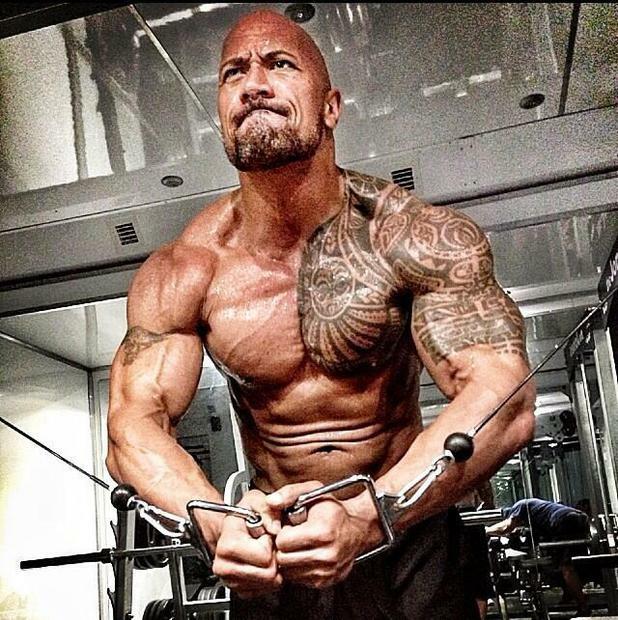 The Rock is known for his big biceps, and you’ll have to give credit to the hard work that he puts in the gym. How did he develop his 20 inch biceps? It starts with four sets of barbell curl, with 10 to 12 reps for each set. After that, he does four sets of the hammer curl with 10 to 12 repetitions for every set. He continues the workout with four sets to failure of the spider curl, then three sets of 10 repetitions of the triceps pushdown. After a short rest, he continues with three sets to failure of dips and then four sets of hanging leg raises, with 20 repetitions for every set. He ends the workout with four sets of 20 repetitions of the rope crunch. On the fourth day, the focus shifts to his back. He starts with four sets of lateral pull down, aiming to finish anywhere from 10 to 15 reps for each set. He continues with four sets of 15 repetitions of the barbell shrug before doing four sets of pull ups. The workout continues with four sets of back extension, with each set having 15 reps. He then does one arm dumbbell rows of four sets and 15 repetitions. The training for the day ends with three sets to failure of inverted rows. In working out the shoulders, Johnson would start with four sets of 12 repetitions of the dumbbell shoulder press. Once he’s done he proceeds with four sets of dumbbell front raise, then four sets of dumbbell side raise. On both exercises, repetitions would be 12 for every set. The workout continues with four sets of 12 repetitions of the standing military press, before he ends the day with three sets of 10-15 reps of the reverse flye. In training the legs, Johnson would begin with four sets of leg press with 25 reps per set. He then does four sets of 25 reps of the barbell walking lunge. Next up would be three sets of leg extensions with 20 reps for each set. He continues with the workout with three sets of seated leg curls, aiming to do 20 reps for every repetition. After a brief rest he performs three sets to failure of the Smith Machine calf raise. The workout ends with three sets of thigh abductor. During the seventh day of the week, Johnson would take the entire day off to rest his body. Aside from following a rigorous training regimen, “The Rock” also maintained a very healthy diet. His diet would consist of large amounts of fats, carbs, and protein to aid lean muscle development. It is not surprising at all that Dwayne Johnson has maintained such a body to die for by following this very tough workout program. Despite being in his 40s, Johnson remains fit. If you’ve always wanted to have a body like that of the Hollywood superstar, then start doing the Dwayne Johnson workout.